Here’s what I managed to fit in. 12:30 p.m. – Arrived at Edinburgh Waverley Railway Station on a Virgin East Coast service that was just delayed enough to get some sweet free wifi for half the journey. Popped my roller bag into a luggage locker at the Edinburgh Bus Station a few blocks away—it was just a few pounds for 12 hours, about half the price of left luggage at the train station. 1:15 p.m. – Wandered through Edinburgh’s Old Town to the tune of bagpipe street performers who made it feel like I was headed to either a wedding or a funeral. 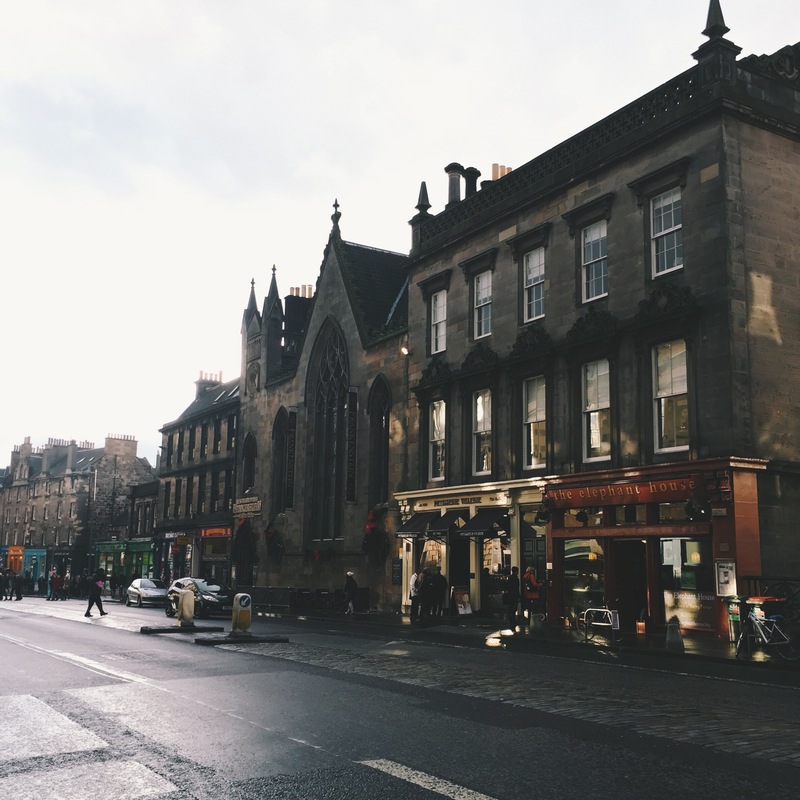 Stopped every few yards to snap photos—people eat up gorgeous old buildings and narrow, winding streets on Instagram, and Edinburgh is full of them. 2:00 p.m. – Arrived at the top must-see destination on my list: The Elephant House, made famous by the fact that J.K. Rowling wrote early parts of the Harry Potter series inside. It had been on my bucket list for fifteen years—I’d wanted to visit since I read about it in an unauthorized biography of Rowling (my O.G. lady hero) when I was eight. Spent a solid hour scribbling in my Moleskine and trying to absorb some creativity while sipping a mocha and a Williams Red Ale, brewed an hour away in Alloa. 3:15 p.m. – Left The Elephant House in search of a post office to send off a postcard from the cafe, but took a detour upon encountering Greyfriars Kirkyard. I’ve always loved cemeteries (probably inherited from my casual genealogist grandmother), and this one is especially old and fascinating. 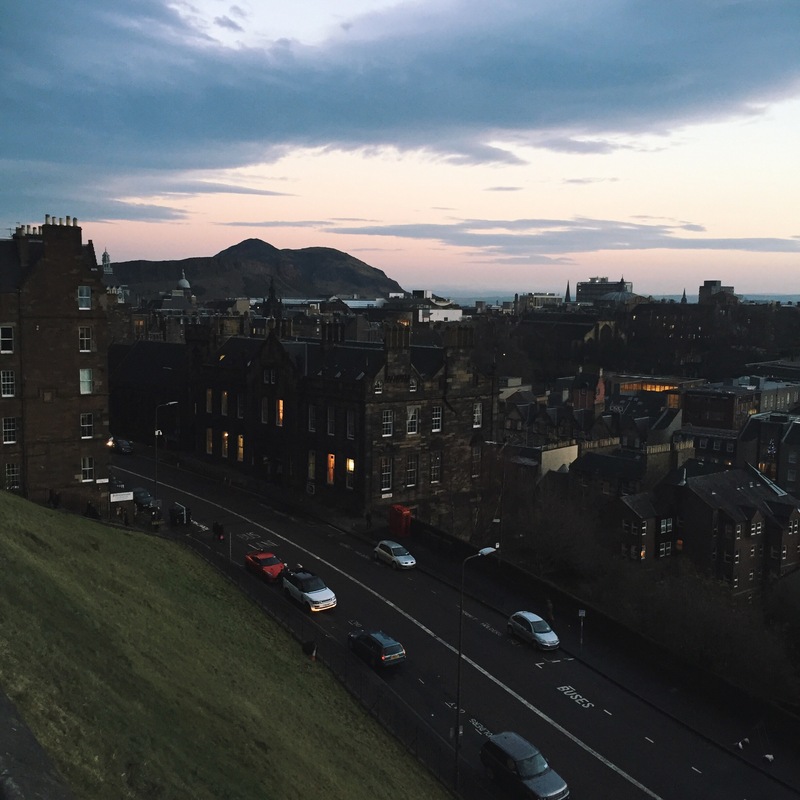 3:50 p.m. – Walked up to Edinburgh Castle, again to the tune of bagpipes, just in time to catch the sun setting over the city—I think watching a sunset from the castle is a must if you visit Edinburgh. I didn’t end up actually going into the castle (the entry fee is £16.50), but it’s worth climbing the hill just to take in the spectacular views of the city as night falls. 5:00 p.m. – Made my way over to the Whiski Rooms for dinner—Foursquare had sent me a notification about their vegetarian haggis earlier in the day, and I couldn’t not try that. It was strange but delicious (though I can’t speak to how it compares to the real thing), and both the sticky toffee pudding I had for dessert and my pint of Williams Midnight Sun were incredible. 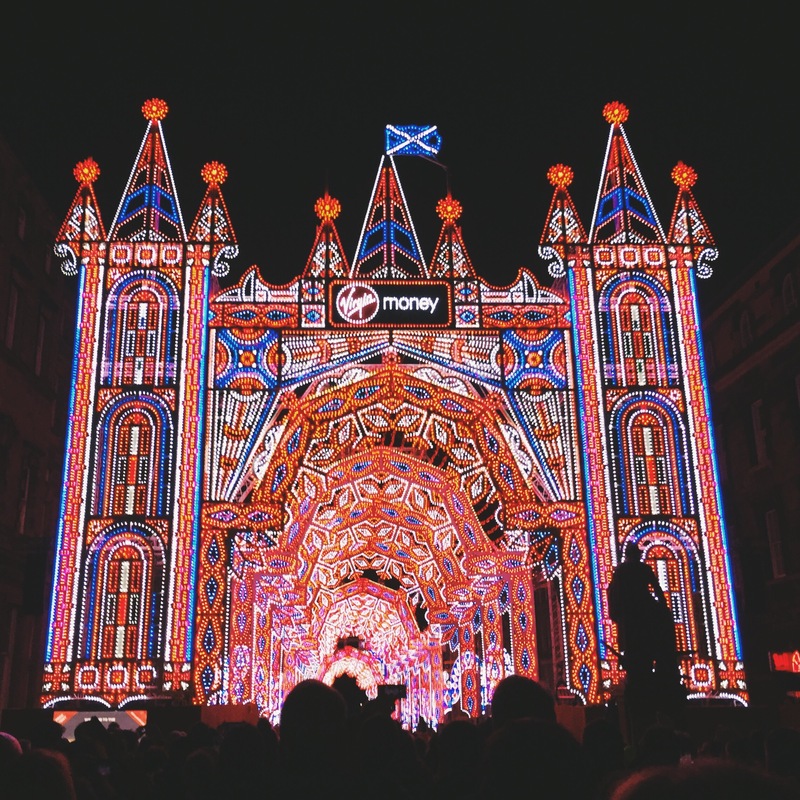 6:15 p.m. – Headed over to the Street of Light, a massive canopy of 60,000 lights along the Royal Mile, choreographed to musical selections performed by the Edinburgh Gay Men’s Chorus. Just spectacular. 7:00 p.m. – Explored the Christmas market in East Princes Street Gardens, a winding labyrinth of stalls hawking gifts and snacks and (lots of) mulled wine. Spent a while sipping said mulled wine on a bench and people-watching. Was eventually approached by someone who claimed he recognized me from a party. Told him I don’t go to parties, and also I’m from America. Sorry, bro. 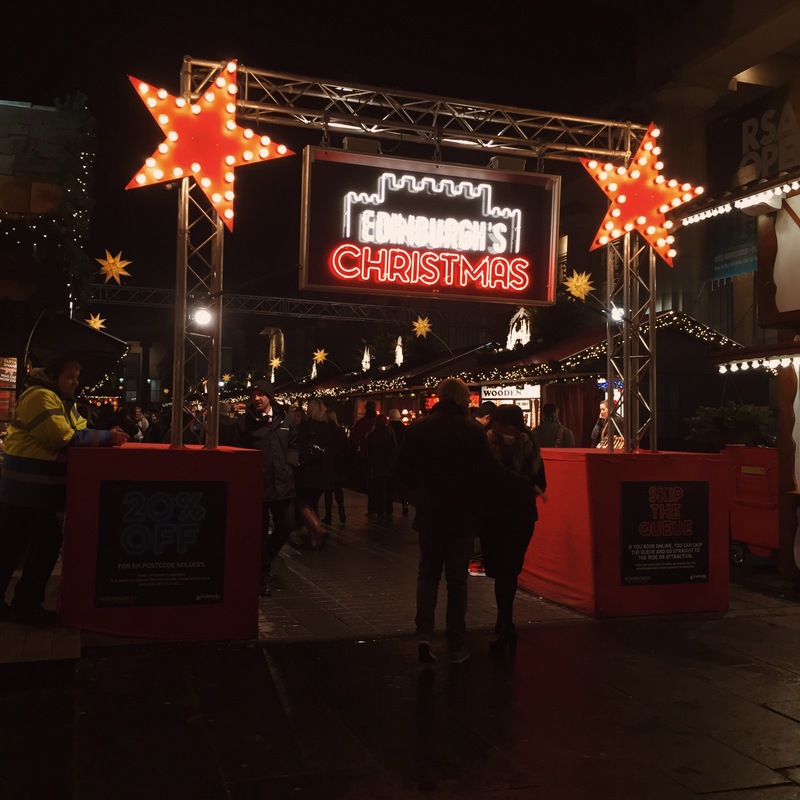 8:40 p.m. – Browsed the shops across from the Christmas market. Left emptyhanded as (a) H&M is a thing in America too, and (b) my suitcase was already dangerously close to overfull. Returned to the Christmas Market for some more mulled wine and to resume creepily observing everyone around me. 9:50 p.m. – Walked up to St. Andrew Square, just as it was being locked up for the night. Still got to look at some of the holiday decorations from the gate. 10:10 p.m. – Returned to the bus station, retrieved my luggage from its locker, and found out that my Megabus was delayed by an hour as a bridge had been taken out of commission by Storm Desmond. But once we finally boarded, the Megabus ride was excellent—more on that at a later date. Of course my half-day in Scotland left me wanting more—I’m hoping to spend a few days there in the next year or two to see some of the places I missed. But as with my brief weekend in San Francisco, I’d still recommend giving it a go. 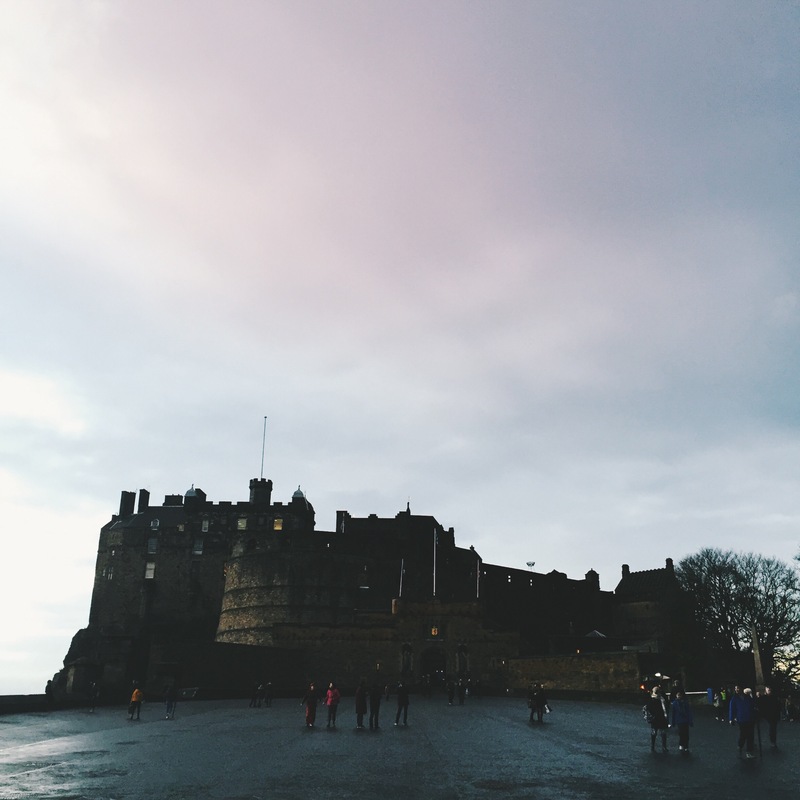 If you’ve only got a day to spare in your itinerary on a trip to the UK, spending that day in Edinburgh is a great idea.